Fr. Chad Ripperger, Ph.D. is a theologian, Thomistic psychologist, philosopher, author, and exorcist. 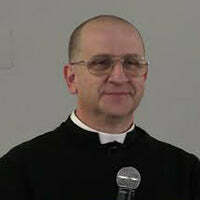 Father Ripperger was originally ordained in 1997, as a member of the Priestly Fraternity of St. Peter (FSSP). He now has his own society, the Doloran Fathers, also known as the Society of the Most Sorrowful Mother, which is located in the archdiocese of Denver. He has a Ph.D. in philosophy and a master's degree in theology from Holy Apostles Seminary in Cromwell, Connecticut. Ripperger has developed a stellar reputation as a stalwart defender of Catholic tradition. He has an outspoken, no-nonsense approach to the Faith, which many of the faithful see as a breath of fresh air.